Supercharge Branded Content with Eleven Digital, Inc. | We All Win Together Vol. 1 — Eleven Digital, Inc.
We are building build our technology with the heart of enabling every organization in the branded content ecosystem to empower brands and publishers to win more customers than ever before. We wrote this blog post to illustrate our heart for our industry. Eleven Digital, Inc. believes we all win together. Our mission is to create a win-win environment for both publishers and advertisers that consumers enjoy at scale. This blog post is dedicated to providing different applications of our technology within the branded content ecosystem for illustrative purposes only. This post does not indicate any business relationships and is to be only used for educational purposes. Our technology was designed with a heart to see that its existence enables every member of the branded content supply chain to win at a greater level. For every member of the branded content supply chain, winning means something different. Branded Content globally is a $100B industry in annual spend since 2017 so there is plenty of money to be made. Let’s start with how Eleven works with Content distribution technology partners like Pluto TV and Connatix. 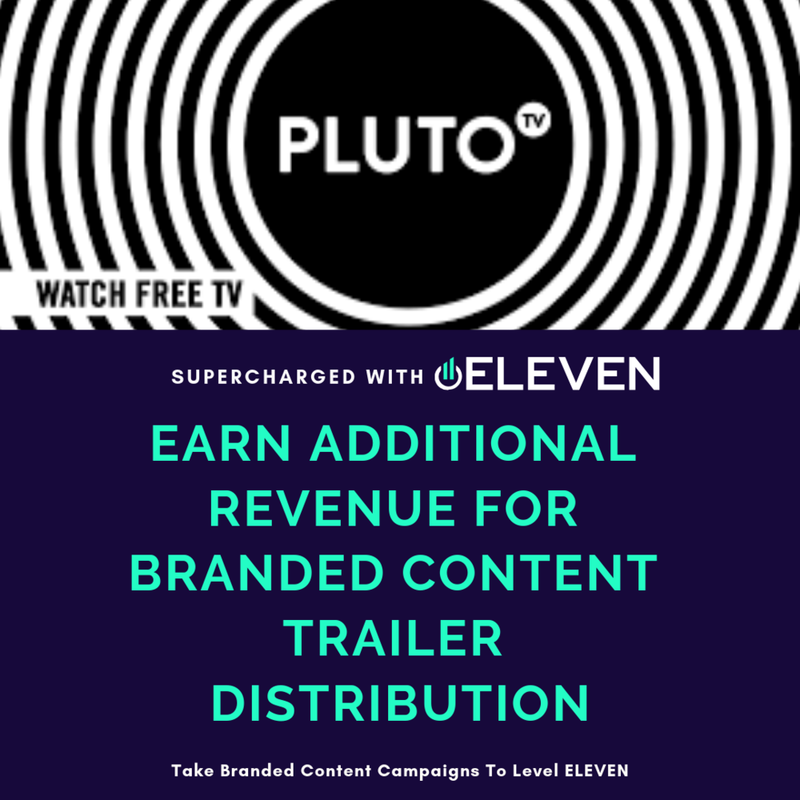 Pluto TV wins with Eleven Digital, Inc through creating an additional stream of revenue through branded content trailer distribution. With Eleven Digital, Inc technology in partnership with Pluto TV, consumers get access to the premium content they love with less commercial interruptions verses any other competitive offering in the market. In addition, the commercials they do see become cultural moments for their target consumers tied to the content consumers love. Content like “What The Fit” or “Cold As Balls” created by LOL Network can gain greater audiences through distributing branded content trailers through Pluto TV. With Eleven Digital, its a win-win for partners because our technology aggregates branded content opportunities across all platforms to create the market density necessary to support market makers like Pluto TV. — Elkanah Reed | CEO of Eleven Digital, Inc. Right now, culturally relevant content like “Lyft Legend” and “What The Fit” can grow their respective audiences for their Brand Partners and simultaneously grow their publishers reach exponentially through the value Eleven Digital, Inc. offers in partnership with market makers like Pluto TV. The same can be said of Connatix. “Connatix makes it simple for publishers to overcome the challenges of monetization, quality, and limited reach of valuable video content ," according to David Kashak, CEO of Connatix. Connatix is the native video syndication and monetization technology for publisher such as Time, CBS Local, Variety, VICE, AOL, Meredith, Mashable, and Tribune Media. Connatix wins with Eleven Digital, Inc through creating an additional stream of revenue through branded content trailer distribution. Connatix can offer publishers through Eleven Digital, Inc. an additional revenue stream through running branded content trailers for non-competitive media. This is a win-win because the publishers that distribute branded content trailers become known to consumers as media providers who share cultural moments with the communities they serve at scale. Eleven Digital, Inc. provides publishers with a way to earn additional revenue through distributing trailers that share brand messages with consumers wrapped in the entertainment they love. Eleven Digital, Inc. technology is platform agnostic. We make branded content sales easy within any distribution channel. Our focus at Eleven Digital, Inc. is being everywhere the consumer is. We have found a kindred spirit in the David Kashak, CEO of Connatix, who in March 2018 released the stories feature for publishers who depend on their tech to remain competitive in an ever changing industry. — Elkanah Reed, CEO of Eleven Digital, Inc.
We built Eleven Digital, Inc. with the same heart. We enable publishers to turn branded content into a healthy revenue stream across every distribution platform. The Global Branded Content Industry is a $100B+ industry in annual spend. Eleven Digital, Inc. ensures every publisher gets their cut every year based on the audience they reach. — Elkanah Reed, CEO at Eleven Digital, Inc.
Now, lets talk about the platforms that support the the management of branded content. One of the older platforms in our industry is Polar. Founded in 2008, Polar is focused on scaling the distribution of branded content across channels and growing views. Polar has developed technology to reduce manual processes and human errors with automated workflows for creative setup and ad server integration. Eleven Digital, Inc. technology enables all partnered publishers through Polar to increase the demand generation for their branded content campaigns. Partnered with Polar’s technology, Eleven Digital, Inc. brings more advertisers to the buying table with ease. Eleven Digital, Inc. technology makes buying branded content anywhere as easy as buying display advertising. Tagger Media is led by Dave Dickman. Tagger Media is focused on unlocking the power of relationships through content partnerships & influencer marketing. Their platform streamlines campaign planning, discovery, activation and reporting so advertising teams can stop guessing and start forming data-driven influencer relationships that will propel their influencer marketing to new heights. In partnership with Eleven Digital, Inc. technology, influencers who work with Tagger Media can organize their branded content schedules for the entire year. Our goal at Eleven Digital, Inc. is to empower influencers to command media size budgets because they reach media size audiences. If you check out our inventory page, Ninja is an influencer who reaches more viewers with one video than The Daily Show With Treva Noah and The Tonight Show Starring Jimmy Fallon combined. 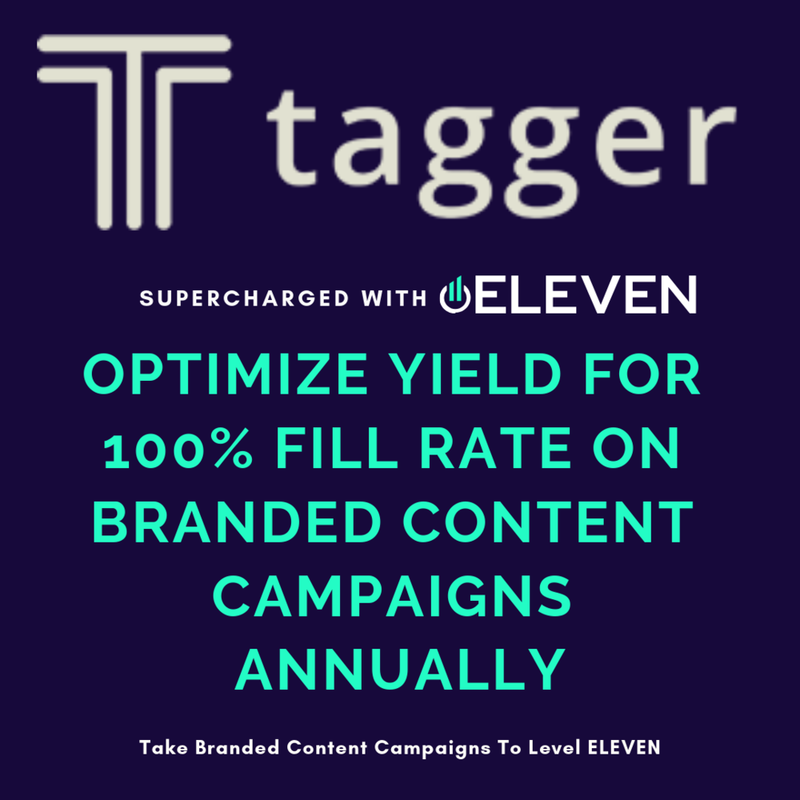 Tagger Media in partnership with Eleven Digital, Inc. delivers more revenue to influencers than ever before while at the same time eliminating the waste in ad budgets through focusing on distributing branded content everyone loves verses the ads everyone ignores. Millennials are becoming the biggest spending generation in the US. Millennials are spending $200B annually in the US. Brands desire their cut of where my generation spends our money at scale. Therefore, Brand Marketers can no longer afford to make ad-hoc decisions behind data. If Brands continue to invest in disruptive ad units alone, they do so at their own peril. Especially when, 74% of ad budgets are being wasted - thats BILLIONS down the drain. Billions that could be invested in branded content to help brands hit their KPIs and earn money for their shareholders on their marketing activities. Eleven Digital, Inc. is building the marketplace to ensure to all the relationships advertisers need for buying branded content anywhere in 1 easy to use system.